Dr. Dan Graham was born in Red Bank at Riverview Medical Center and raised in Middletown. He attended high school at Middletown South, graduating in 2007. Dr. Graham then went on to Rider University in Lawrenceville, NJ for college and stayed in NJ for medical school and residency. Dr. Graham received his D.O. 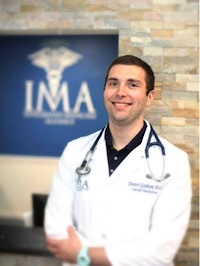 from Rowan University School of Osteopathic Medicine, in Stratford, New Jersey and completed his residency in Family Medicine at Virtua Hospital in Voorhees, New Jersey. Dr. Graham is a board certified physician in Family Medicine and member of the American Academy of Family Physicians. In his free time, Dr. Graham loves trying new foods, traveling to see live sports, and enjoying nature.